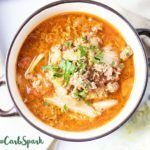 This unstuffed cabbage roll soup packs all the flavor of cabbage rolls, and it can be made easily in the instant pot, slow cooker or on the stove. It’s the perfect low carb keto dinner because it’s hearty, full of vegetables and fuss-free. A bowl of warm soup under a cozy blanket is all I need for these cold days. I love cabbage rolls, but that’s a ton of work involved, and as you know me, I’m a fan of easy recipes. 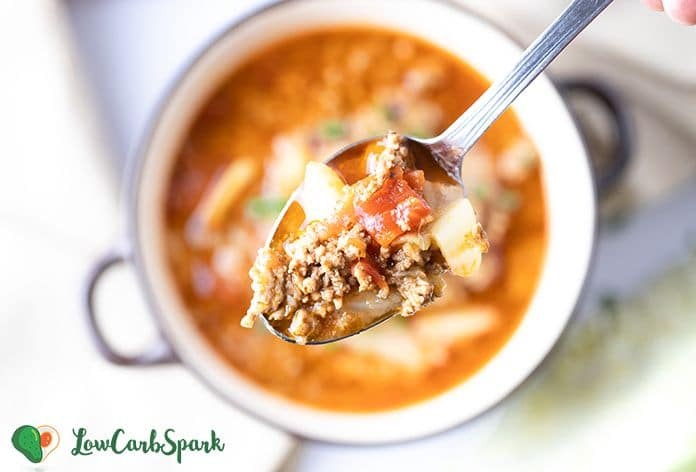 This deconstructed cabbage rolls soup is budget-friendly and you can feed your family members with a nutrient-dense, delicious meal. Also a dish great for meal prep! 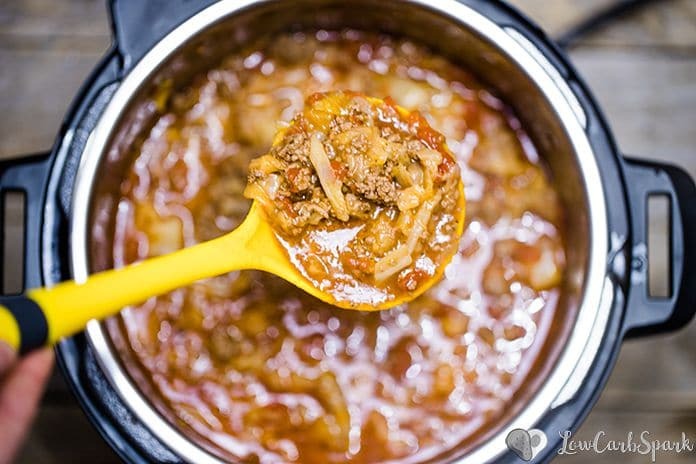 Today I’m showing you how to make this tasty keto soup, and I’ll provide the instructions to make it in the Instant Pot, Crock Pot or on the stove. No matter the cooking method this unstuffed cabbage soup it’s effortless to make and packed with tons of flavor. Watch this quick step-by-step video showing you exactly how to make this delicious keto soup! To make the soup low carb and keto friendly I don’t use rice. You can use Shirataki Rice or use cauliflower rice instead. 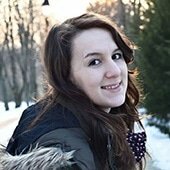 How to make Unstuffed Cabbage Roll Soup? 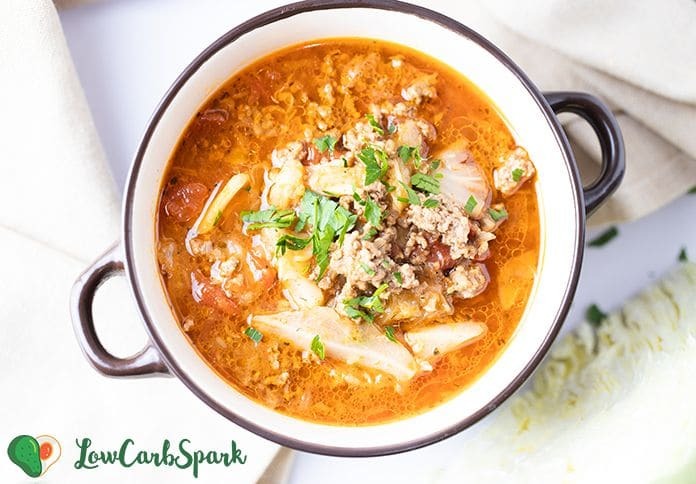 There are a few basic steps you need to follow if you want a belly-warming bowl of soup that’s full of nutrients and low in carbs. You’ll need 2 pounds of ground beef, turkey or pork. For some extra smokey flavor add in a few slices of bacon. All you have to do is to brown the onion, garlic, and beef. Add the chopped cabbage and the rest of the ingredients and let it simmer for about 30 minutes. In the Instant Pot, use the Soup button, and your soup is ready in 10 minutes. The instructions are very similar if you want to use a slow cooker. Turn on the Instant Pot “Sauté” setting and add olive oil. Brown chopped yellow onion, garlic until translucent (3-4 minutes). Add the ground turkey and sauté frequently stirring until the meat is no longer pink. Drain the excess fat. Add the chopped cabbage, diced tomatoes, broth, and the seasonings. DON’T STIR! Put the lid on the pot, lock it in place and turn the valve to the Sealing position. Press the “Cancel” button and then press the “Soup” Function. Use the +/- button to set it to 10 minutes. 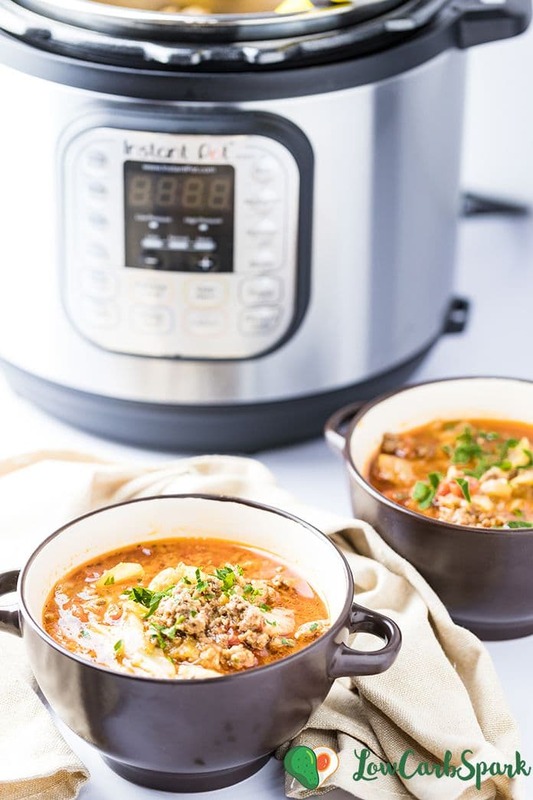 Allow the Instant Pot to come to pressure and complete the soup program. Let undisturbed for 8 minutes (natural release), then do a Quick Release for the remaining pressure. This step will take a few more minutes since the Instant Pot is full. To do a quick Release use a use a wooden spoon or a dish towel to push the steam release valve towards the Venting position gently. Stir soup, taste and season with more salt, pepper or red pepper flakes. Garnish with fresh parsley before serving. 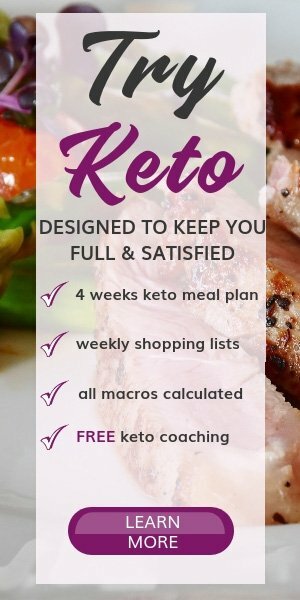 Serve with some delicious keto dinner rolls. Enjoy. In a medium skillet add olive oil and sauté until translucent. Add the ground beef, break apart with a wooden spoon and cook for a few minutes, stirring occasionally. Drain grease. Add all the ingredients you the Slow Cooker and place the lid. Cook for 3-4 hours on HIGH or 7-8 hours on LOW. In a large soup pot heat the olive oil over medium-high heat. Add the onion and garlic and sauté for 2-3 minutes, until the onions turn clear. Add the ground beef and cook for 7-8 minutes until the beef browns. Add the cabbage, broth and the rest of the ingredients. Stir well and place a lid on the pot. Simmer for about 30 minutes or until the cabbage reaches desired consistency. Great recipe. I’m on a low carb low fat diet so I used ground turkey. It is delicious, super easy to prepare and great leftover. I am making this for the second time exactly by the recipe but no cumin this time. I love cumin I just want to try it without.